What Price to Rent can I buy at today? H/T to Captain Capitalism via Smalldeadanimals for the graphic. 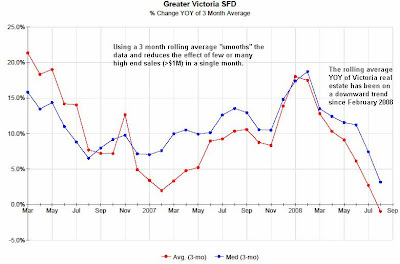 A while back, the media went gaga over a recent UBC/Sommerville study that contradicted a slightly less recent Merryl Lynch study regarding fundamental value in the national and local real estate markets. ML came up with 35% as their benchmark for targeted balance between what a house is worth based on what rents are. UBC came up with 11%. UBC used that bastion of accurate statistics, Craigslist, to determine what market rent in Vancouver is. ML, they used CMHC and StatsCan numbers (I believe, but may be mistaken here). Things are changing fast and furious on the employment front for myself and the Mrs these days and we may be looking for a new place again. I started looking this weekend, not physically, but just online. I went and re-read the post over at Langley Financial Planning about how Mohican buys a house, and I completely agree with both his rationale and math. Is it possible to find a deal like this in Victoria today? So here's a bit of a challenge to all the readers of this blog. Find me a condo, townhouse or a SFH with a suite, that I can realistically buy today (not necessarily asking price here, think lowball offers that may get accepted, target Tuscany Village, Reflections etc... places we know are struggling with sales and economics and can realistically throw low offers to). Benchmark these places against Craigslist's dreamland of market rents and lets make a deal. Keep 10-15% down, 25 year mortgage, price under $425K parameters in mind. I'll keep looking too and do up the math on your suggestions and grow this post over the next week or so. Here's the first one. It's a 2-bed 2-bath unit on the Gorge. I have no way of knowing if it is the same unit for sale as for rent, so this isn't exactly accurate science here folks, but close enough for a comparison non? Craigslist ad: rent at $1295 plus hydro. MLS # 247947: currently for sale at $245K after 107 DOM (original price $264,500) incidentally, it's neighbour is also for sale at $259,900 after 119 DOM and original price of $279K. Here are the numbers: Rent = $1295 per month. Ownership costs = (10% down mortgage, 5.25% over 25 years = $1315 per month) + $173 strata fees + $95 property taxes = $1583 per month. 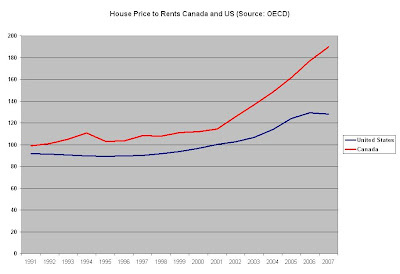 Price to rent ratio is 189 (funny how it mirrors the graph above eh?). Monthly payment difference is 19%. Price to rent of 166, and monthly payment difference of 8%. There are two problems with this scenario: 1. I think $1295/month for a Gorge Rd condo at Tillicum is inflated compared to market rent, probably by as much as 15%/month; and 2. I don't think that a seller that isn't in distress, and is just "motivated" at this stage would be willing to consider an offer that is almost 20% lower than their original asking price. I could be wrong, but even if I am, I'm still overpaying for this property. When I do up numbers like this, it really hits home for me just how far out of whack this market has gotten, and how far it needs to fall to return to a balanced state. So when you read the local real estate pumpers punditry that this market has returned to "balanced", remember they aren't speaking of market fundamentals, they're speaking of buyers vs sellers, and they're wrong anyway, because clearly, it's a definite buyer's market. 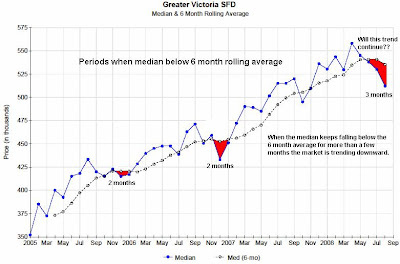 Courtesy of, and a big tip of the hat to, Roger, for such great statistical analysis of the Victoria and Island real estate markets. 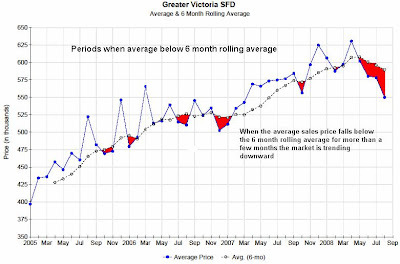 He's hit another one out of the park with his latest slideshow: Are Victoria prices falling? I've made much over the spin job we see the MSM (particularly the VanSun and the TC) doing when it comes to how market information is portrayed in the local media. Is it the responsibility of journalists and editors to delve into the information and fact check it, when the local real estate boards release their market information related to the MLS system? the principles of — truthfulness, accuracy, objectivity, impartiality, fairness and public accountability — as these apply to the acquisition of newsworthy information and its subsequent dissemination to the public. 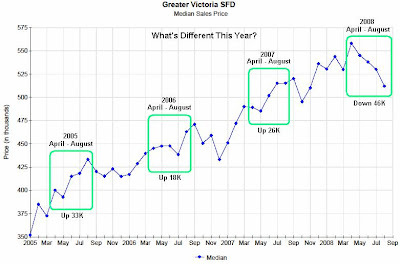 Let's take a look at the most recent news piece on the Victoria August numbers. Tony Joe, president of the VREB, is quoted as an expert. As is the developer behind Chelsea. This statement is fundamentally true. Well-priced properties can, and do, move quickly. He's told us a few things this month: the market dropped by 5%, if you want to sell your place next month, drop your price, and if you're looking at buying, low-ball. He's also telling us REALTORs are the only ones with the ability to well-price your home. His job is to increase sales volume, not necessarily price, and that is what I see is his focus; he's a confidence cheerleader. His explanations of why sales are down "vacation-caused" are weak. We know they are weak. Roger has proven them patently false, using VREB's own data. Does Tony have a responsibility to prove his assertions? 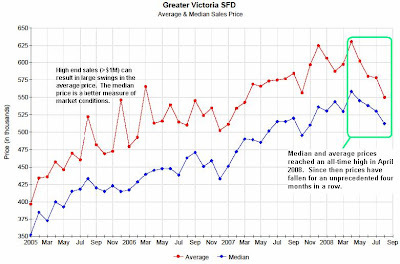 I think such a small statement can get passed off, and should be, by anyone looking at buying or selling a house in Victoria. Look, if you're buying or selling, that one sentence in one article on one day should not be the deciding factor in your decision. The bigger question is, should Carla have called him on it? Does she, or her editors, have a responsibility to fact check a quote? Probably not. She is publishing someone else's statement, not her own, and not trying to take credit for it. She should make sure she quoted him correctly, and if she did, Tony ends up wearing the egg on his face. The trouble is, it spits in the face of those of us who wrongly assume that the MSM has journalistic integrity in today's market place. Are we wrong to expect it? The internet has changed everything. It has democratized information. You and I, we both have the same access to information as the average journalist these days. We can decipher the spin, we can analyse the stats, we can even publish our opinions and facts that we find. If I spouted off on this blog more often, you wouldn't read it. Many people don't. The MSM has been slow to adapt to the internet reality, as have the players that rely on them to get their messages out. In effect, these gang of change-fearing "presstitutes" are committing a slow suicide. Check out their stock valuations, they're not making money and they're getting hammered by investors. 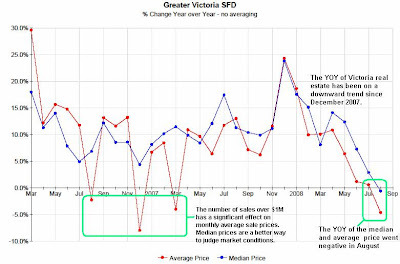 Victoria Real Estate Board President, Tony Joe, notes that today’s buyers now have more properties from which to choose than at any time since 1996. "The number of properties available for sale is now at the highest level in over 12 years, increasing in August to 4,657. That represents a 39 per cent increase compared to August of last year." Joe notes that prices moderated last month with nearly 46 per cent of single family homes selling for under $500,000. 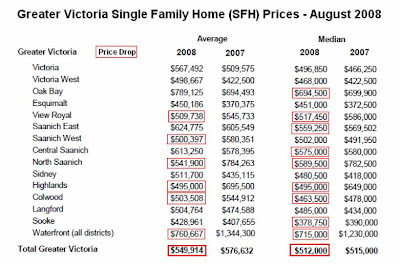 "The average price of single family homes in Greater Victoria last month was $549,914, down from over $578,000 in July; the six-month average was $592,582 though the median price in August was considerably lower at $512,000." Joe noted that eleven single family homes sold for over $1 million in August, including two sales on the Gulf Islands.